Michael Joseph Piazza ( /piˈɑːtsə/; born September 4, 1968) is a former American professional baseball catcher who played 16 seasons in Major League Baseball (MLB), from 1992 to 2007. He played most notably for the New York Mets and Los Angeles Dodgers, while also having brief stints with the Florida Marlins, San Diego Padres, and Oakland Athletics. A 12-time All-Star and 10-time Silver Slugger Award winner at catcher, Piazza produced strong offensive numbers at his position; in his career, he recorded 427 home runs—a record 396 of which were hit as catcher—along with a .308 batting average and 1,335 runs batted in (RBIs). After his father asked Lasorda to select Piazza as a favor,  the Miami-Dade Community College student was drafted by the Dodgers in the 62nd round of the 1988 MLB amateur draft as the 1,390th player picked overall. Lasorda asked Piazza to give up his first base position and learn how to catch to improve his chances of reaching the major leagues, and helped him attend a special training camp for catchers in the Dominican Republic. Piazza became an excellent hitter, especially for a catcher. His MLB debut came with the Dodgers on September 1, 1992, against the Chicago Cubs. He drew a walk in his first plate appearance and then doubled to deep center field in his first official at-bat, against Mike Harkey of the Cubs. He hit his first home run on September 12, 1992, against Steve Reed of the San Francisco Giants. He only appeared in 21 games that season, hitting .232. He played seven seasons for the Dodgers until he was traded to the Florida Marlins on May 15, 1998. Piazza and Todd Zeile went to the Marlins in return for Gary Sheffield, Charles Johnson, Bobby Bonilla, Manuel Barrios, and Jim Eisenreich. He only appeared in five games with the Marlins, where he hit .278. On October 2, 2005, Piazza played his final game in a Mets uniform. Because it was well-reported that Piazza would soon depart to free agency, Mets manager Willie Randolph elected to replace Piazza after the eighth inning. After the Shea Stadium crowd of 47,718 serenaded him with a standing ovation, Piazza humbly bowed to the stands and blew kisses to the adoring fans. The game was delayed for eight minutes while fans shouted and clapped in recognition of Piazza's legendary tenure of 972 games over nearly eight years with the Mets. As the ballpark's video screen displayed memories of Piazza, players from both the Mets and Rockies stood at the steps of their dugouts. 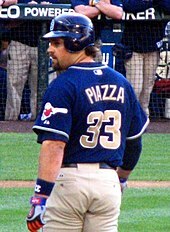 Following the 2005 season, Piazza signed a one-year contract with the San Diego Padres on January 29, 2006. Prior to the start of the 2006 season, Piazza represented Italy in the 2006 World Baseball Classic. On August 8, 2006, Piazza played his first game at Shea Stadium since leaving the Mets. Throughout the three-game series, Piazza drew frequent standing ovations from New York fans. It was on par with that of Tom Seaver on his return to pitch at Shea Stadium in 1977 and 1978. Even more telling was during that series, on August 9, he drew a rare curtain call in the opposing park following a home run off Mets pitcher (and former Dodgers and Mets teammate) Pedro Martínez in the 4th inning. Not done for the day, Piazza went deep off Martinez again in the 6th. And with the Mets ahead 4–2 in the 8th, and two runners aboard, Piazza hit one to the wall in center, nearly bashing his third homer of the day and putting the Padres ahead. On July 25, 2007, in the top of the ninth inning in a game between the Angels and Athletics at Angel Stadium, a fan threw a water bottle that hit Piazza, who had homered earlier in the game. Piazza then pointed his bat in the stands at the fan he believed threw the water bottle to get the attention of security. The fan, who was identified as Roland Flores from La Puente, California, was arrested by the ballpark security. Piazza pressed charges against Flores. Flores was sentenced to 30 days in jail and three years of probation on March 27, 2008. On September 26 against the Boston Red Sox at Fenway Park, Piazza hit his 427th and what would be his final major league home run of his career off of rookie pitcher Jon Lester. Piazza is known as among the best-hitting catchers of all time, hitting 427 career home runs and having an OPS of .922. Only nine other players have ever had over 400 home runs with over a .300 lifetime average while never striking out more than 100 times in a season ( Ted Williams, Stan Musial, Lou Gehrig, Mel Ott, Hank Aaron, Babe Ruth, Vladimir Guerrero, Albert Pujols, and Chipper Jones). The New York Mets retired his uniform number, 31, in a ceremony on July 30, 2016  prior to the Mets' game against the Colorado Rockies at Citi Field. Piazza is known to be a fan of heavy metal music and is featured on the CD Stronger Than Death by Black Label Society. He is also godfather to Zakk Wylde's son, Hendrix. He often cohosts Eddie Trunk's Friday Night Rocks show on WAXQ ("Q-104.3 FM") in New York City and was featured as the primary guest on an episode of That Metal Show. He is also an accomplished drummer and has performed on stage with various bands. Piazza is a devout Roman Catholic. His faith was instilled in him by his Catholic father  and was featured in Champions of Faith, a DVD documentary exploring the intersection of Catholic religious faith and sports. He also appeared in the follow-up video Champions of Faith: Bases of Life. In 1993, Piazza hit 35 home runs, the most by any rookie catcher, eclipsing Matt Nokes' 32 home runs for Detroit in 1987. Additionally, Piazza's 35 home runs were the most home runs by any Dodger rookie, until Cody Bellinger's 2017 campaign. He was named the All-Star Game's MVP, in 1996, after he went 2–3 with a double, home run, and two RBIs at Veterans Stadium in Philadelphia, near his home town of Phoenixville. His .362 average in 1997 was the highest ever by an NL catcher, breaking the 60-year-old record of .354 set by Gabby Hartnett in 1937 and tying the MLB record set by Bill Dickey, who also batted .362 for the New York Yankees in 1936. This record was broken by Joe Mauer, who hit .365 in 2009. Hit his 200th home run on September 16, 1998, at Houston. The home run, a three-run shot with two outs in the ninth inning against Billy Wagner, gave the Mets a 3–2 lead in a game they would win, 4–3, in 11 innings. On September 21, 2001, 10 days after the terrorist attacks of September 11, Mike Piazza hit a home run in the first professional sporting event in New York City since the attacks, giving the Mets a 3–2 lead over the Braves. ^ Nisse, Jake (July 17, 2018). "Mike Piazzas soccer team goes bust". New York Post. Retrieved July 18, 2018. ^ Osowiecki, Stan. "Mike Piazza". Society For American Baseball Research. Retrieved February 22, 2017. ^ a b c Berlind, William (October 17, 1999). "Mike Piazza's 'Loudmouth' Dad Nervously Watches Mets Advance". New York Observer. Retrieved April 13, 2013. ^ a b c d e Coffey, Wayne (June 7, 1998). "HOMETOWN HERO METS'S PIZZA HAS BECOME FAVORITE SON OF PHOENIXVILLE, PA". New York Daily News. Retrieved April 13, 2013. ^ "The Ballplayers – Mike Piazza". BaseballLibrary.com. Archived from the original on August 9, 2009. Retrieved November 27, 2008. ^ Richards, George (July 5, 2017). "Babe Ruth, Satchel Paige and A-Rod part of Miami's long and storied baseball history". Miami Herald. Retrieved September 13, 2018. ^ a b c Schwarz, Alan (May 21, 2008). "Piazza Calls It Quits After 16 Years and 427 Homers". New York Times. Retrieved October 6, 2010. ^ a b "Mike Piazza from the Chronology". BaseballLibrary.com. Archived from the original on August 9, 2009. Retrieved November 27, 2008. ^ a b Noble, Marty (September 27, 2008). "Piazza's post-9/11 shot became iconic Slugger's dramatic game-winning homer added to legacy". MLB.com. Retrieved March 4, 2009. ^ "2004 All-Star Game Box Score". Retrieved October 5, 2008. ^ Kernan, Kevin (April 14, 2016). "Mets fans spend big to rescue Piazza 9/11 jersey as museum piece". New York Post. Retrieved July 21, 2017. ^ Kernan, Kevin (April 5, 2016). "Frustrated Mike Piazza speaks out on Mets' 9/11 jersey shocker". New York Post. Retrieved July 21, 2017. ^ "Piazza, one of greatest hitting catchers in MLB history, retires". Associated Press. May 20, 2008. Retrieved May 20, 2008. ^ Keh, Andrew (February 20, 2017). "Mike Piazza Learns How to Be an Owner. Of a Soccer Team. In Italy". The New York Times. ISSN 0362-4331. Retrieved May 3, 2018. ^ Powell, Robert Andrew (December 18, 2018). "The Passion of Mike Piazza: How the midlife crisis of a baseball Hall of Famer led to the demise of a 100-year old Italian soccer club". The Athletic. Retrieved December 24, 2018. ^ Brescia, Joe (May 7, 2010). "If the Hall Calls, Piazza Wants to Enter as a Met". New York Times. ^ "Legendary Met Mike Piazza To Address Steroid, PED Rumors In New Book". CBS News New York. Retrieved January 11, 2013. ^ Webner, Richard. "Randy Johnson, Pedro Martinez, John Smoltz and Craig Biggio elected to Hall of Fame". jacksonville.com. The Florida Times-Union. Retrieved January 6, 2015. ^ "Mike Piazza to be inducted into Mets Hall of Fame on Fan Appreciation Day". MLB.com. Retrieved July 15, 2013. ^ "Long Shot". Simon & Schuster. Retrieved August 4, 2014. ^ "Known for big bat, Piazza was underrated defensively". MLB.com. Retrieved Jul 21, 2016. ^ "Schrodinger's Bat". Baseball Prospectus. Retrieved July 21, 2016. ^ Simon, Andrew (January 25, 2016). "Mets to retire Mike Piazza's No. 31". m.mets.mlb.com. Retrieved July 22, 2017. ^ "Alicia Rickter-Piazza – Mike Piazza's Wife (Bio, Wiki, Video)". Fabwags.com. Wag Group. Retrieved July 22, 2017. ^ Mike Piazza – verified account (July 13, 2013). "Mike Piazza on Twitter: 'Marco Vincenzo Piazza, he is already hitting well to right field!'". Twitter.com. Retrieved July 22, 2017. ^ Thomasos, Christine (July 26, 2016). "Mike Piazza Celebrates His Mom and Gift of Catholic Faith During Hall of Fame Induction". The Christian Post. Retrieved October 20, 2017. ^ Heyman, Jon. "NY SPRING TRAINING / East Is Eden / Piazza's found contentment after leaving the West Coast", Newsday, March 21, 1999. Accessed February 21, 2011. "Piazza looked long and hard in Brooklyn but eventually settled on a house in secluded Cresskill, in Bergen County, N.J., away from the action but closer to his mom and pop in Valley Forge, Pa."
^ Jon Heyman – verified account (April 22, 2016). "Jon Heyman on Twitter: 'Octagon is handling Mike Piazza's marketing now. #HOF'". Twitter.com. Retrieved July 22, 2017. ^ Vass, George (April 1996). Here's How Division Races Shape Up for the '96 Season. Baseball Digest. Books.Google.com. Retrieved February 16, 2011. ^ "June, 1996". Archived from the original on June 29, 2007. Retrieved June 24, 2007. ^ "IBAF Baseball World Cup 2009 – rosters". Archived from the original on September 15, 2009. Retrieved September 15, 2009.